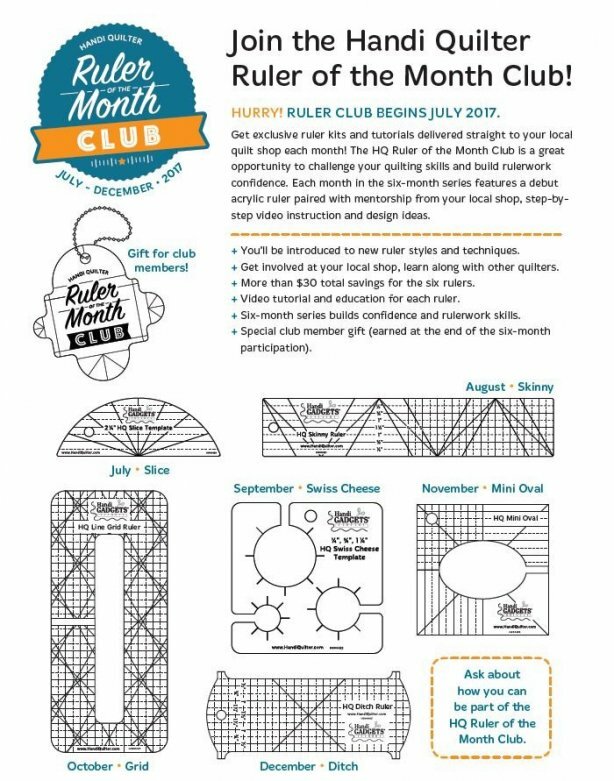 Join the Handi Quilter Ruler of the Month Club! Club meets on the 4th Friday of each month July - November, 2nd Friday in December. Get exclusive ruler kits and tutorials delivered straight to your local quilt shop each month! The HQ Ruler of the Month Club is great opportunity to challenge your quilting skills and build rulerwork confidence. Each month in the six-month series features a debut acrylic ruler paired with mentorship from your local shop, step-by-step video instruction and design ideas. Each debut ruler is specially priced at only $22 for Club members- not available until 2018 without Club membership. Free Gift with purchase of all six club rulers! $30+ savings on ruler MSRP over the course of the 6-month series. Requirements: Purchase of the Ruler of the Month is required each month for class participation.